The 3.75m x 0.78m is the ultimate storage unit for narrow places. 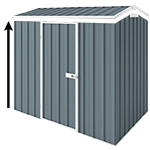 This shed is a fantastic solution if you have a narrow strip but still want decent storage! There are amazing possibilities to customise your shed and add a wide range of accessories. You can increase the standard 1.82m wall height to 2.1m but this is just the beginning. You can change the hinged doors to sliding doors, add louvre window, skylight, shelving, tool holders and the list goes on.